The bag holder rings for separate collection against terrorism, are designed to ensure maximum safety, due to reasons of terrorism, for installation in sensitive areas such as airports, railway and underground stations, large shopping malls, sports facilities such as football stadiums and/or similar, and all public buildings such as post offices and banks. The bag holder rings, then arise from the need to make the content of the inspected transparent bags, especially in all those situations of large influx of people where, for safety reasons, it is necessary an easy and quick control of the waste placed in the containers . 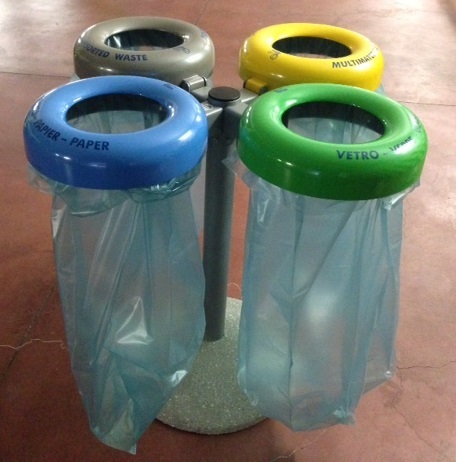 The available and feasible solutions can be varied, from a single ring with or without a lid, placed on the wall or on a pole mount, until the realization of multiple structures of 2/3/4 bag holder rings mounted on steel supports, thus creating veritable mini ecological islands for separate collection of waste minutes.